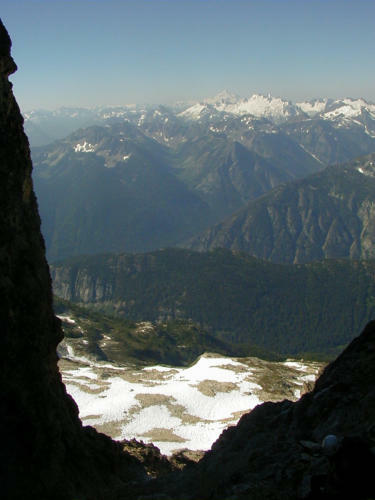 Perhaps the best views we’ve ever had on a climb were the ones Doug, Rick, Laura and I had on a clear summer’s day at the top of Goode, a 9,200-foot peak on the eastern side of the North Cascades. 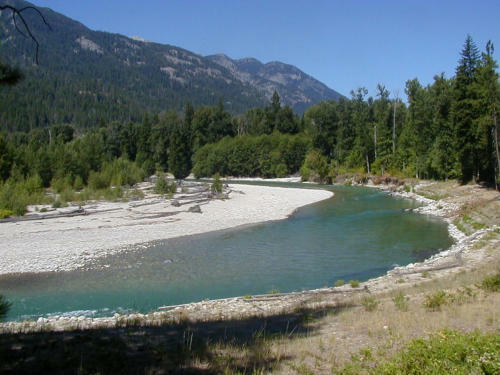 It’s also one of the trickiest to get to: a drive from Seattle to Lake Chelan, a 2+ hour ferry ride to Stehekin, a 1-hour bus from there into remote parts of the Park, and then a 1-hour National Park Service shuttle to the Park Creek Trailhead: all told, 7 hours of travel just to start walking. We stashed our extra food and change of clothing in the metal bear box at the trailhead and started up the trail around 1:30 p.m. in the high heat of the day, fighting off biting black flies for the first 3,500 feet of elevation gain. 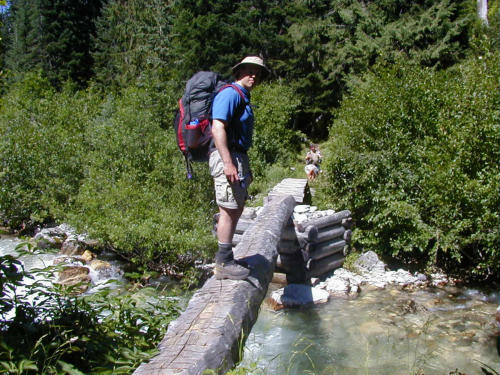 After we crossed two running streams and filtered another liter of water apiece, we continued toward the four-mile mark at an elevation of about 4,000 feet, entering the next forest area within about .25 mile of the second stream. 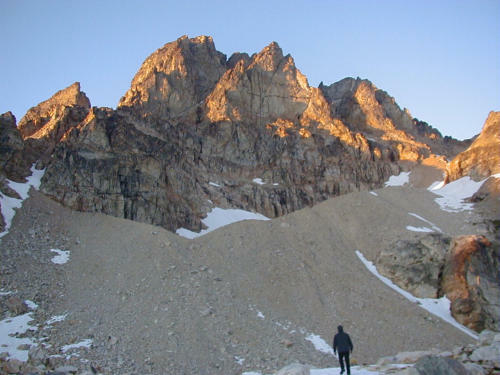 The beginning of the climber’s trail up to the basin is roughly 300 paces (count ‘em!) into the wooded area, where a big boulder and small rock cairn to the right mark the entry to the forest directly below Goode’s SW Couloir. The trail is a little hard to follow for the first 300-400 feet; our most recent trip report beta instructed us to stay right to gain the ridge. The trail became more apparent as we attained the ridge just left of the drainage gully. We caught our first hints of a breeze that very occasionally would disperse the flies for a moment or two. 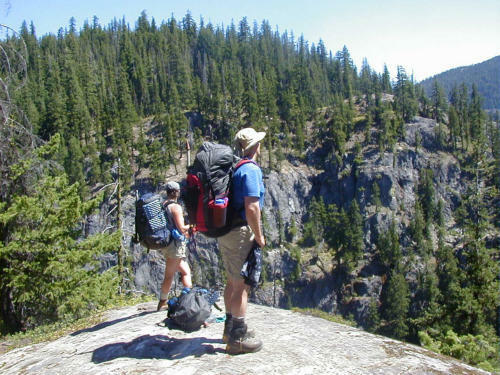 At about 5,500 feet the trail emerges from the forest ridge into a meadow. While watching for gopher (mouse? mole?) holes, I happened to stumble upon a female grouse that must have been as startled as I; she started to squawk and strut, and then suddenly rushed toward my head beating her wings vigorously to make her appear large and scary. It worked. I cried out, “What do I do, what do I DO! ?” in a bit of a panic, as I’d never before been attacked by fearless flapping fowl. My teammates called out helpful tips about clearing the nest far left, so I dropped down a few paces and gave the bird a wide berth, heart beating wildly from something other than exertion. I found myself wondering whether it was the same grouse Don Schaechtel taped in his video of the climb a year earlier. 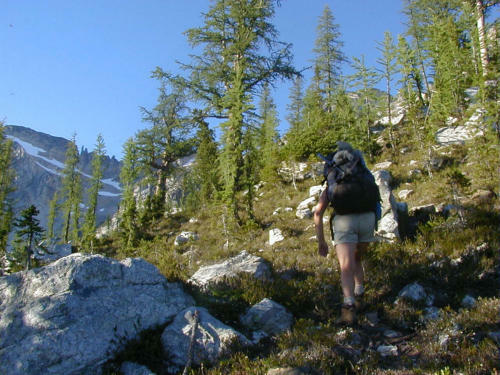 We made our way up the meadow, passing through two small groups of trees until we were at 6,700 feet. 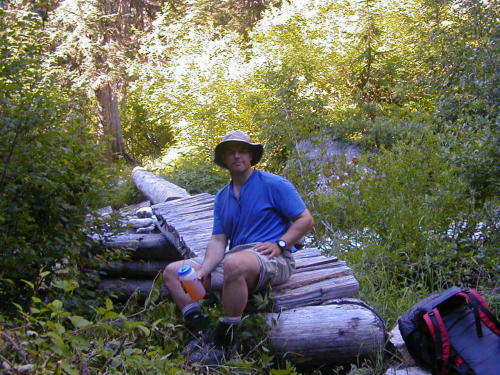 Since we hadn’t yet found running water, we took a short break before continuing on in search of a place to camp near snow. You can make your way up the talus slopes either to the right or to the left around a steeper headwall; we ascended right, but descended left. At 7,200 feet we finally found melting snow patches that would be perfect for filtering, and a nice flat area nearby where we found sufficiently flat spots on soft ground for tarps. It was nearly 8 p.m. so we hastily changed clothes, ducked back into our mosquito netting, refilled all our water bottles, set up our tarps, and relaxed with a quick hot dinner before turning in. We hadn’t seen a single soul the entire afternoon. Our campsite at the bottom of scree that leads to the Couloir.had some of the most spectacular views I’ve ever had in any camp. The forecast was for clear skies with 0% chance of precipitation; imagine our surprise when we heard a few raindrops smattering the tarps throughout the night. 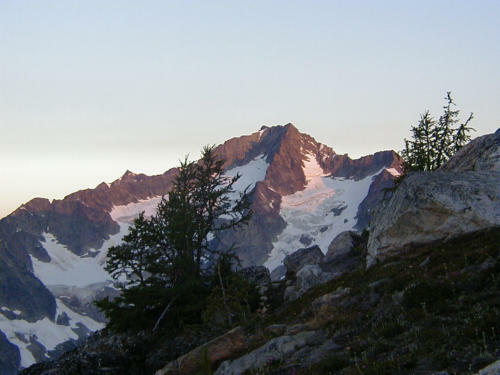 By the time we woke up at 6:30 on Saturday (7/26), the few clouds that had formed the previous evening were gone, and the upper slopes of Goode taunted us to come out and play. 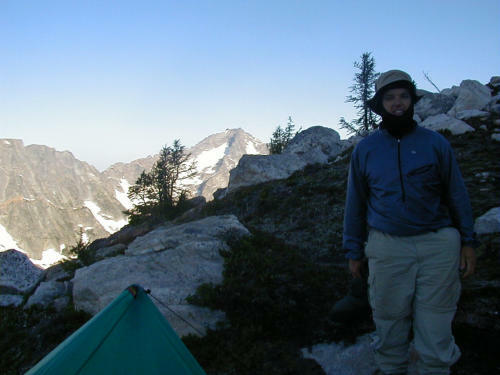 We started out from camp around 8 a.m. carrying light packs with food, sunscreen, harnesses, helmets, bug spray and netting, and 2 liters of water apiece. 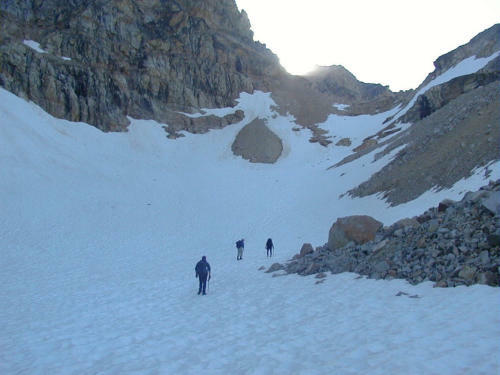 We each had an ice axe, though once we’d ascended the lower scree slope and kick stepped up the snow to the base of the Couloir, we stashed them in a pile so we could have our hands free for scrambling. 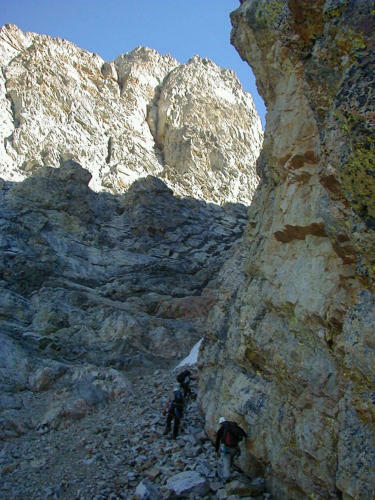 We entered the Couloir from the east (right) side and then headed toward the left where the more resistant dark basaltic rock forms nice stair steps up the bottom two thirds of the couloir. We managed to stay fairly close together to minimize the chance of getting pelted by loose rocks kicked down by accident. Just below a chimney section, travel turns from 3rd class scrambling into easy low fifth class climbing for a short 100- foot pitch. We roped up here. There is a sloping ledge to the right with a rappel station in the middle that can be clipped for pro as you traverse to the right. 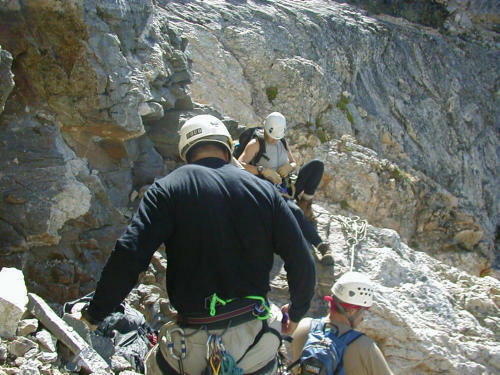 Once you get across, you can continue to scramble to the notch above, passing another rappel station that we used as a double rope rappel on the way down. 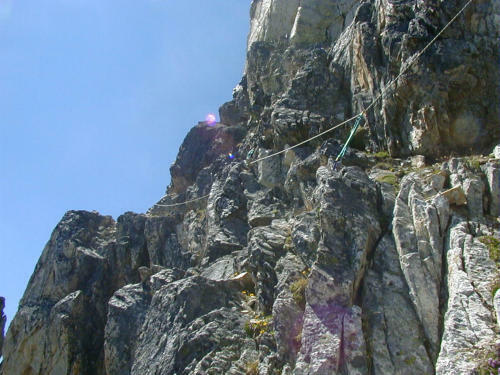 Once you reach the notch, the second roped pitch is next, an airy traverse involving eight feet of downclimbing halfway across to attain a wide ledge. 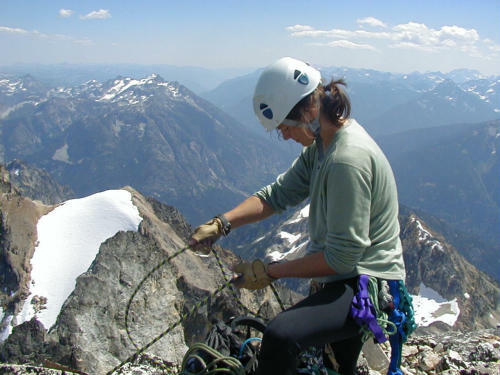 Head over to the edge of the NE Buttress and scramble up about 20-30 feet to a good belay spot with a view of the east side of the mountain. 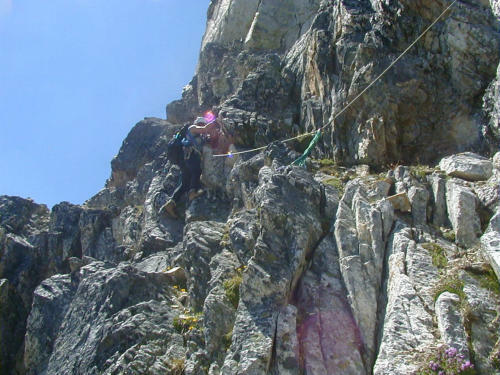 Here the route gets a little tricky, as there are several ribs with slings for rappels and it’s not obvious which is the easiest way to travel. We found ourselves on mid-fifth class rock with lichen in places, suggesting that we were off route. 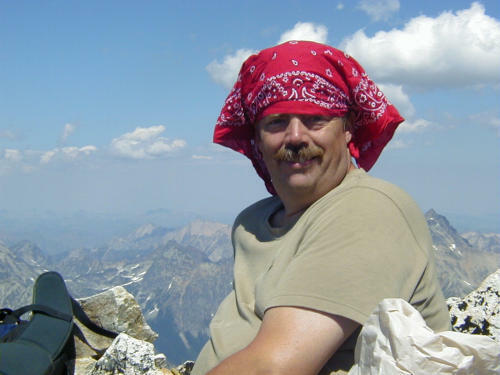 We crossed a few narrow gullies of the same resistant stair-step basalt rock we found on the other side of the mountain, and eventually found the well-traveled wider ledge a little above the belay station and right. Stay on the ledge until you reach the end (we did this part in running belays) and then scramble straight up to the summit 140 feet higher. 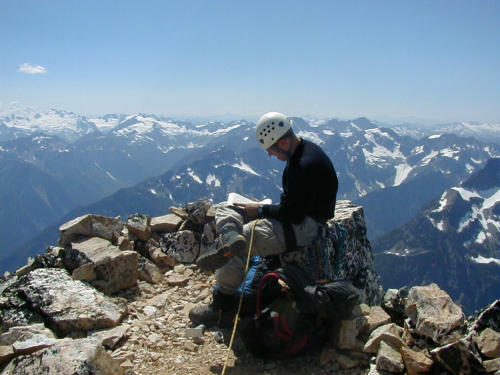 We stayed at the bug-free, comfortably cool summit for quite a while, soaking in the views, eating some lunch, basking in our accomplishments, and remarking at the single hummingbird that “buzzed the tower.” At 3 p.m. we started back down, reversing each pitch with downclimbing and traversing (not to mention one tricky “Oh My God!” arête move I led that left me quaking in my boots) until we regained the Couloir. 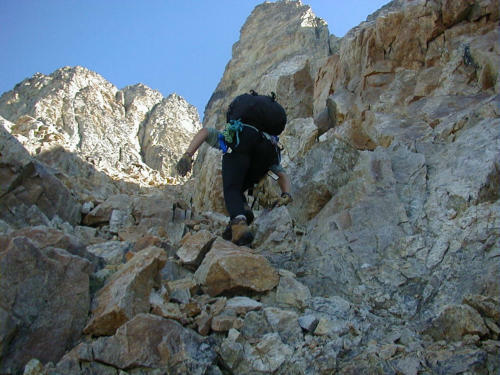 We did one double rope (60m) rappel to the top of the Couloir’s basalt intrusions where we could once again resume our “crab crawl” down climbing. 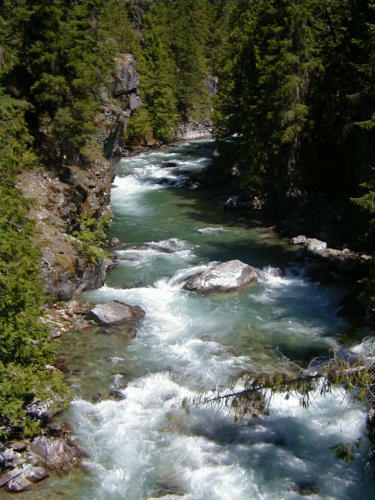 We returned to camp a bit before 7 p.m. and easily downed a liter apiece of cold, wonderfully refreshing filtered water. The bugs greeted us with renewed vengeance, so we hid under bug netting while preparing dinner. About an hour later, a couple appeared in camp seemingly out of nowhere. They’d just completed the NE Buttress route and were headed back toward their cars at Rainy Pass. 44 miles round trip with 9,000’ elevation gain in the short span of 24 hours! Sunday morning the plan was to hit the trail by 6 a.m. so we would have plenty of time to find the trail down and catch the 10:45 shuttle to start the long journey back home. We were up at 5 a.m. delighted to find the temperature cool and comfortable for our final hike out. 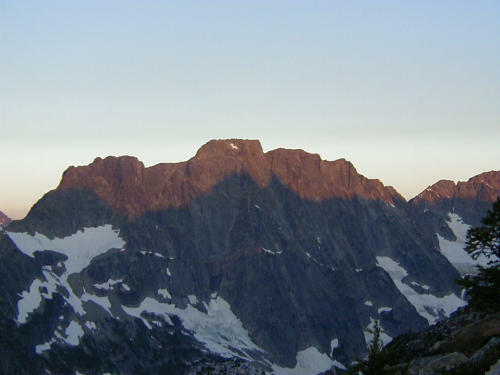 We snapped a few final photos of pink-tinged Buckner, Glacier Peak, and the shadow of Goode cast on Booker. The only people we saw on the way out that morning were two men heading in to do trail maintenance. The bugs stayed asleep until we reached the trailhead a few minutes before 10, when they once again attacked our bared skin. 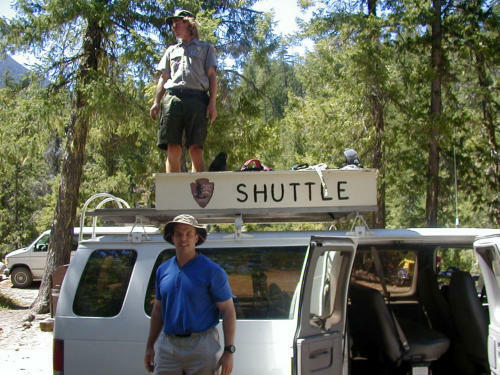 We caught the shuttle on its way up the road and convinced the ranger to let us ride up and back with her in order to get out of the bugs and enjoy the air conditioning. 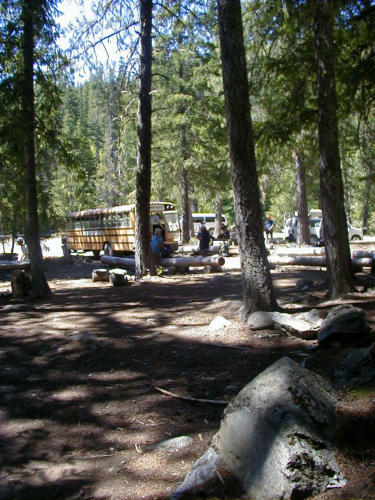 Jim (the transportation specialist) had his bus waiting for us at the ranger station, and he stopped for a few minutes at the bakery so his load of adventurers could stop to fill themselves with pizza, sticky buns, sodas, or whatever else the bakery offered for lunch. 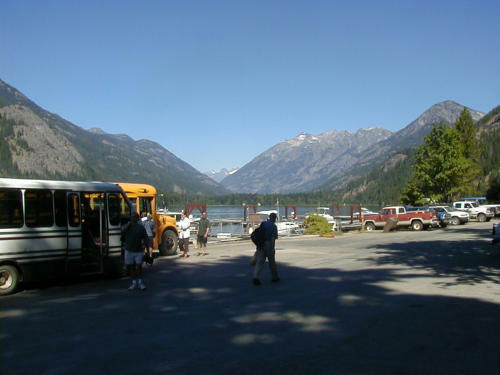 Once we reached Stehekin, we had an hour before our ferry left, so we sat in the shade, checked out from the climb, visited the Pacific Crest Trail restocking shop, and dangled our feet in the deep cool Lake Chelan water. Rick probably enjoyed himself the most as he chose to go for a quick swim. Once on the Lady of the Lake ferry, we had a 2 hour and 45 minute journey back to our van, and then the long drive back to Seattle. 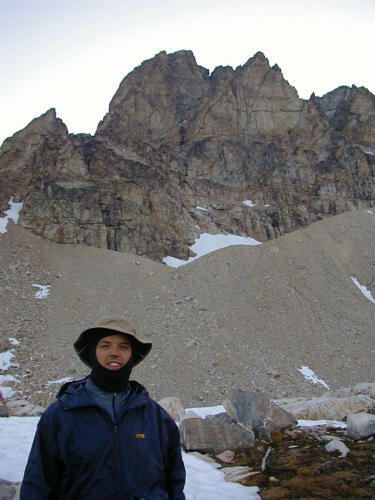 It was a most memorable trip with remarkable views and good solid rock to climb. Following are pictures in order taken. 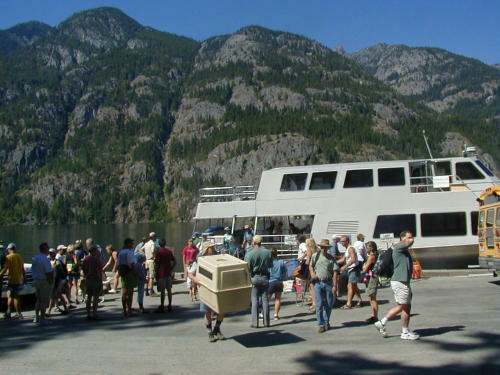 Ferry at Stehekin, unloading passengers and cargo. 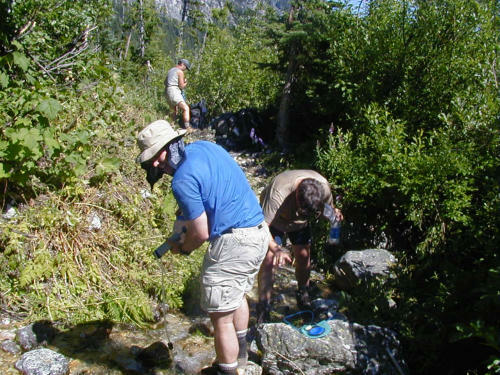 Filtering water at the second running stream; Doug, Rick and Laura fight off flies at the same time. Our first good look at the Goode massif with drainage in the foreground. 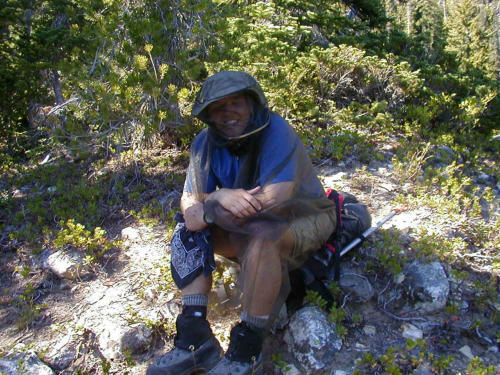 Doug in mosquito netting takes a short break in the shade. Laura hikes from meadow to rocky slopes at about 5,800 feet. 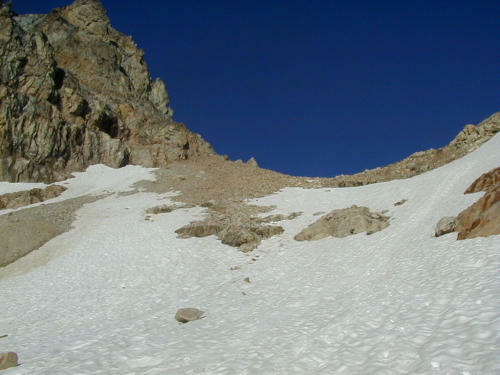 Goode from camp at 8 p.m. Route heads up the notch in the talus onto snow, then far right to gain the SW Couloir. 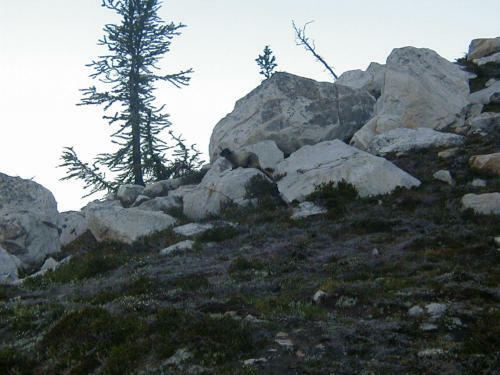 Marmot in camp was the only company we had the first night. 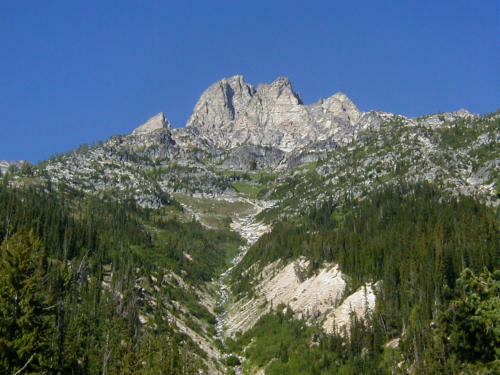 Buckner (foreground) and Eldorado (right). 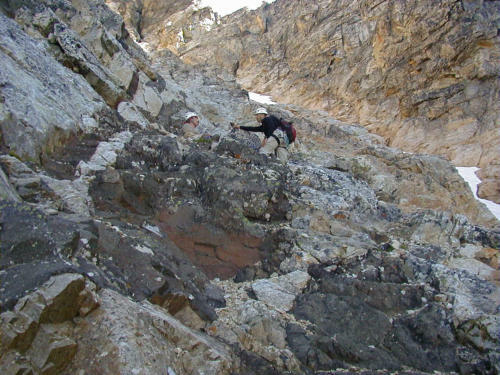 Doug and Rick heading up the dark basalt "stairsteps" to the left of the Couloir. 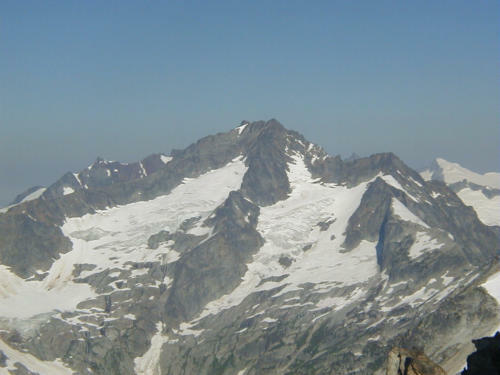 Glacier Peak from 2/3 up the Couloir. 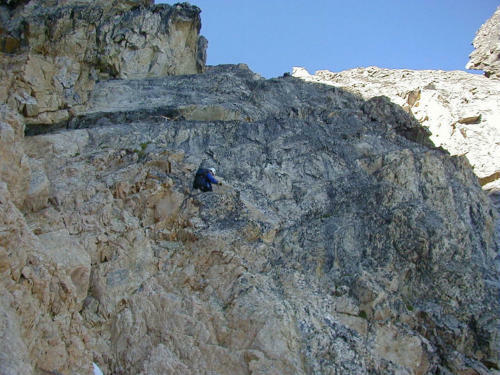 Second roped pitch on the other side of the notch involves an airy 8-foot downclimb. Eureka! Doug signs us in at the summit register before we enjoy fantastic views. Laura belays Rick up to the summit. 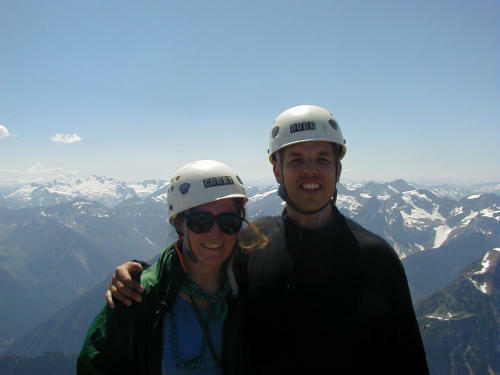 Courtenay and Doug at the summit of Goode, 9,200'. 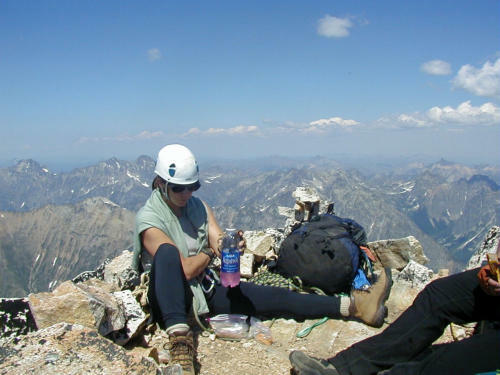 Laura relaxes at the summit while sipping Cytomax. Rick poses with his new bandana style. Deep blue contrasts with white snow to show the clarity of the weather we experienced all three days. 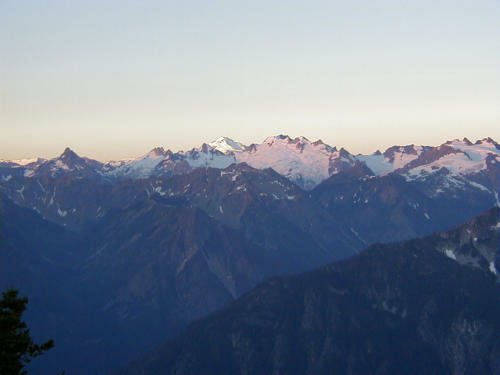 Sunrise on Glacier Peak, Sunday. Goode's shadow cast on Booker, 5:30 a.m.